The boys and I are going out of town for 10 days. We are first staying with a dear friend in PA for three days. We are then going to visit my mom in NYC for a week. I am feeling a little anxious about staying in someone else's house, as they don't follow a zero waste life style. We will continue with our challenge this week, however we might accumulate more trash than normal. This will definitely be more difficult and take more effort on our part. The week we are with my mom, should be fairly easy though. She has a Whole Foods within walking distance and I am bringing some supplies with us. The picture below shows what I am taking on our trip. It might seem excessive but it is basically what I take with us on a normal shopping trip. We added cloth napkins, 5 jars with food, cooler bag, lunch box and water bottles. 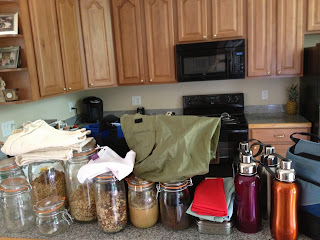 I am taking the jars with food so that I can contribute with groceries in a zero waste way. We are ready for the strange looks we get from people when the cloth napkins our pulled out. With a little extra preparation anyone can travel in a zero waste way.